MHC I is found on the surface of all nucleated cells. Specialized in presenting antigens that come from invaders inside the cell, e.g. viral proteins. 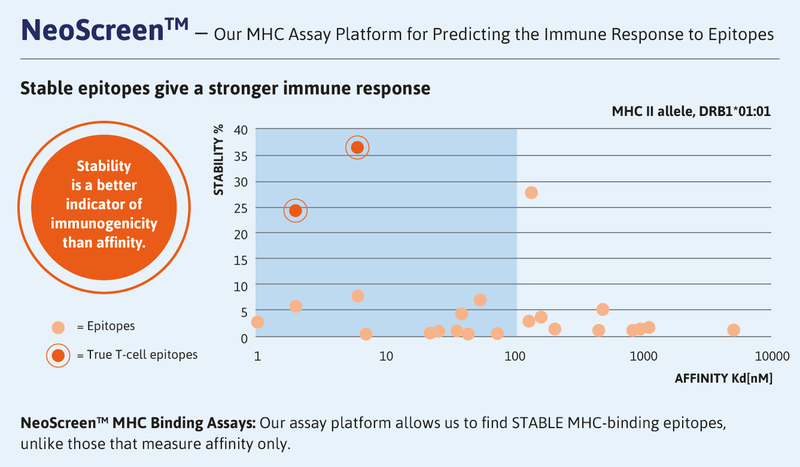 Predicting the Immune Response with MHC I. Use MHC I to identify epitopes that can trigger CD8+ response. Neo-epitope verification for CD8+ cell response. MHC II is found on antigen-presenting cells (APCs). Specialized in presenting antigens from extracellular invaders, such as bacteria. Use MHC II to map triggers of CD4+ cells. Neo-epitope verification for CD4+cell response. Immunogenicity assessment of new biologics. Role: Extending the half-life of IgG and serum albumin, by reducing degradation. Conjugation of some drugs to the Fc domain of IgG or serum albumin can significantly increase their half-life.